. : OpenGL, GLSL, Lua, Direct3D, GPU :. Fog implementation using GLSL - Use of gl_FogFragCoord, gl_FragCoord, gl_FogCoord and gl_Fog variables. This article shows a workaround of a GLSL bug present in the Catalyst drivers 7.11 and 7.12. Two examples of mesh deformers using the GPU: surface deformer and mesh twister. This tutorial shows the common techniques of texturing and their implementation with GLSL (simple and multtexturing, sphere mapping, dual paraboloid mapping, cube mapping, texture warping, projective texture mapping). Explanation of the vertex displacement mapping technique to deform a mesh using a texture look up from a vertex shader. The problem of normal-map (or bump-map) compression and how to solve it (renormalization - swizzled-DXT5 - ATI 3Dc). This article presents the Phong lighting model and its implementation in GLSL for point and spot lights. Theory and implementation on GPU with GLSL of Mandelbrot fractal rendering. Introduction to GPGPU. Image filtering and GLSL filters implementation (convolution kernels). Pr�sentation of ambient occlusion lighting technique. Occlusion-maps creation. Ambient occlusion GLSL shader. Bump mapping implementation using GLSL shader. Lighting equations. Tangent space. Presentation and creation of normal-maps (or bump-maps). Texture compression (S3TC - DXT1/5) and how use it in Demoniak3D. This tutorial presents the basis about GLSL shading language. GLSL shader integration into Demoniak3D. This tutorial shows how to use the LUA socket lib to setup a TCP/IP Server and how to use coroutines for handle the server infinite loop. Basis about LUA programming. Variables, tests, structures, functions. The french translation of Beyond3D's article. A complete review of the 3d pipeline of SM3/DX9 graphics controllers. An introduction to graphics controllers. This tutorial shows how to load an image file with DevIL 1.7.5 and use it as a texture in OpenGL. Demo binaries as well as source code are provided. Here is a short tutorial about how to create an OpenGL 3.0 rendering context with the latest ForceWare 181.00 graphics drivers. 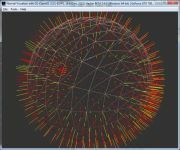 This article also lists the five new OpenGL extensions exposed by ForceWare 181.00.. The new OpenGL extensions exposed ForceWare 180.42 graphics drivers. The new OpenGL extensions exposed Catalyst 8.10 graphics drivers. The new OpenGL 3.0 extensions. Creation of an OpenGL 3.0 rendering context. A review of geometry instancing techniques in OpenGL. The new things brought by the NVIDIA's G80 GPU in the OpenGL Programming. The Complete Guide Of OpenGL Vertex Buffer Objects (VBO). This article aims to quickly introduce you to RaptorGL and showing a simple example of how to use it. 3D window initialization. Gouraud triangle rendering. Lit and textured mesh rendering. Spherical environment mapping and stencil buffer. Shows the use of DevIL library for image loading. Shows how to use C++ 3D models exported from LynX 3D Viewer. Specular highlights. Shows how to load a compressed texture and how to setup the trilinear filtering. Shows how to use the VBO (Vertex buffer Object) and the GLSL (OpenGL Shading Language). Introduction to demoscene and demomakers's world. A demoscene-like product coded with Demoniak3D. Page generated in 0.0028419494628906 seconds.